Agriculture is the leading cause of tropical forest loss in Latin America. New research from the University of Bern says institutions – including environmental policies, laws and regulations – are vital in preventing agricultural expansion, and deforestation. Higher inequality can cause ruptures within communities, and prevent collective action needed to protect the environment. 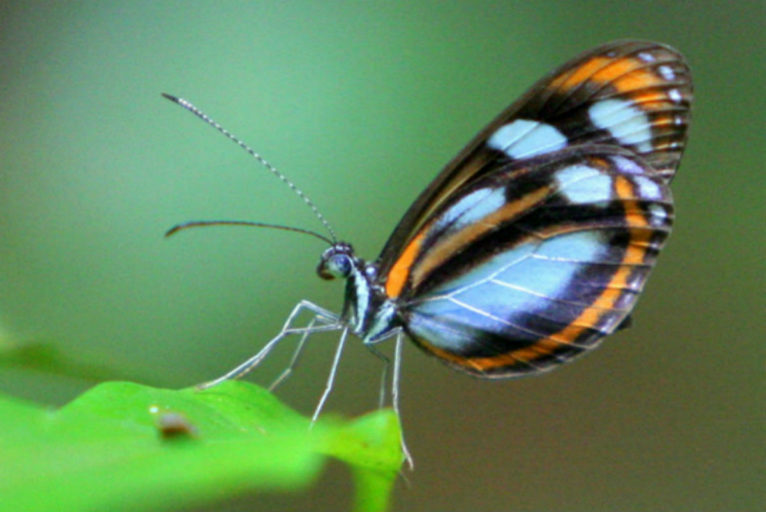 QUITO — The world is losing its tropical forests at an alarming rate, despite increased efforts to save them. A recent study now shows that the best way to tackle deforestation, at least in Latin America, is to reduce inequality. In a new report on the subject published in January, scientists found a direct correlation between agricultural expansion at the expense of forests and levels of inequality. In other words, higher levels of inequality lead to more deforestation, whereas better equality leads to better forest protections. Scientists are increasingly looking for new ways to save tropical forests as an essential tool in the fight against climate change. 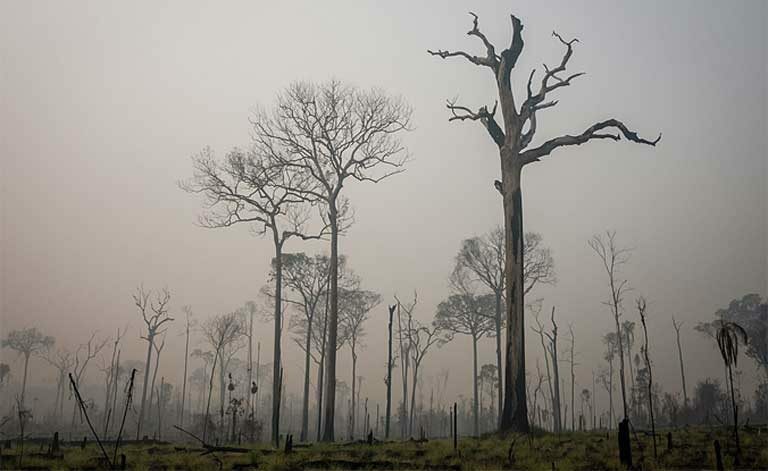 A recent report by Global Forest Watch found that tropical forest loss accounts for some 8 percent of the world’s annual carbon dioxide emissions, ranking just below the United States, and significantly more than the European Union. 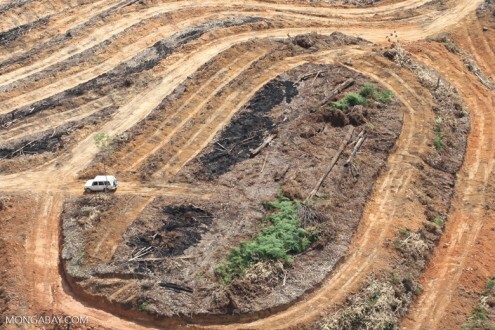 In Latin America, agriculture is one of the leading causes of tropical forest loss. Commercial agriculture generated almost 70 percent of all deforestation in the region between 2000 and 2010, according to the U.N.’s Food and Agriculture Organization. Ceddia’s research says the answer is both — it all depends on the strength of institutions. This includes the environmental policies, rules and regulations in place, and the political will to implement them. Previous research has already shown that countries with higher rates of inequality suffer from a number of problems, including weak institutions, Ceddia says. These weak institutions are less likely to implement regulations, including controls on agriculture expansion. “Institutions are the rules of the game, and they are important for protecting the environment. So a country with high corruption, for example, is less likely to enforce proper environmental protections,” Ceddia told Mongabay via Skype. Scientists have long debated whether social and economic power imbalances play a role in deforestation. Ceddia’s study is the first to find significant links between agriculture productivity in Latin America, whether or not it leads to farmland expansion at the expense of forests, and different forms of inequality (wealth, income and land). Published in the Proceedings of the National Academy of Sciences, the study looks at a variety of real-word data from 10 Latin American countries (Argentina, Bolivia, Brazil, Colombia, Costa Rica, Guyana, Mexico, Peru, Suriname and Venezuela) over a 20-year period (1990 to 2010). Across the board, the pattern of the role of inequality was “consistent and statistically robust,” Ceddia said. But how does inequality trigger agriculture expansion and further deforestation? The study provides two hypotheses. First, unequal land distribution — when land ownership is concentrated in fewer hands — makes it easier for agriculture to expand, as there are fewer land owners to deal with and fewer costs of acquiring more territory. One example highlighted in the study comes from the states of Mato Grosso and Pará in Brazil. Here, agriculture expanded significantly from 2000 to 2005 as producers sought out areas where land ownership was fragmented and concentrated. High inequality could also cause ruptures within communities, making it harder for collective action initiatives to arise that could otherwise protect the public interest and the environment. Where equality is higher, communities are more likely to cooperate, says Ceddia. The invasion of Amazon protected lands generally occurs as a progression. Illegal loggers, often well armed, typically arrive first, cutting canopy trees, and burning over the land. 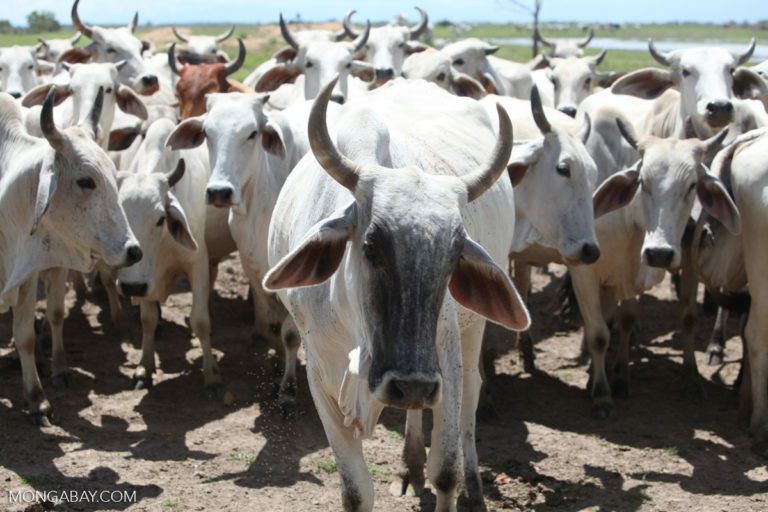 Cattle ranchers move in next, grazing the deforested area. Then, after the passage of time, soy growers and other large-scale agribusiness moves onto the degraded land, planting crops which require heavy pesticide use. The loss of the forest generally forces indigenous people out of their former homes. Image by Bruno Kelly © Greenpeace. Carlos Mazabanda, Ecuador field coordinator for Amazon Watch, has long been working with indigenous communities in the Amazon rainforest. Though their struggle here is not directly related to agricultural expansion, Mazabanda says he has seen several cases where indigenous communities have stopped major infrastructure or extraction projects because they are organized and work collectively against the encroaching party. 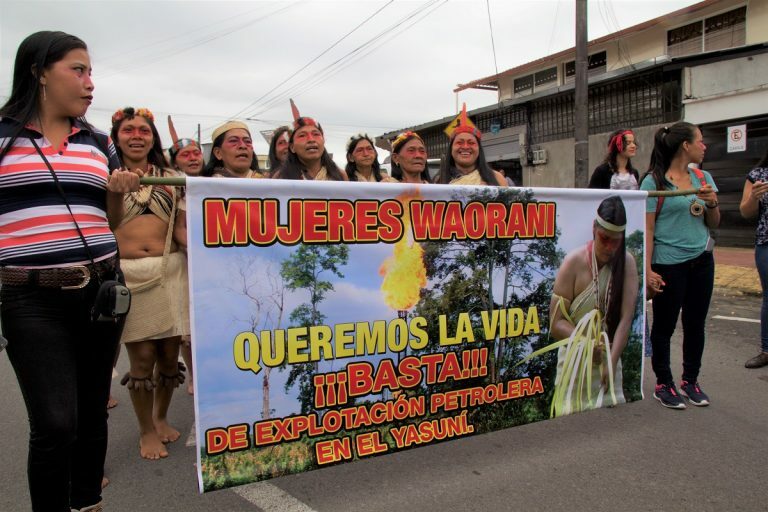 “The indigenous organization in the Amazon is very strong, and when there’s a conflict, like with a mining or oil company, they become stronger,” Mazabanda said, citing the example of the Shuar community that has driven oil companies out of its territory several times to protect the forest. In areas where poverty is higher, where indigenous communities are no longer able to live off the land and are forced into consumerism, communities are more likely to be fragmented and see further environmental damages. Collective action here fails because communities don’t see any other option, says Mazabanda. Several other studies have found similar results, that when indigenous land rights are recognized, deforestation goes down. One study by the World Resources Institutefound that by securing indigenous land rights in just Colombia, Brazil and Bolivia, nearly 60 million tons of CO2 per year could be prevented from entering the atmosphere through avoided deforestation. The University of Bern study suggests a number of policies that could be implemented that would address inequality and also protect forests. These include adding land value taxes, creating better inheritance laws and land reforms; and recognizing indigenous peoples’ land rights. Ceddia said he supported policies created to curb inequality, but considered taxes on land more effective, as they are harder to hide compared to taxes on income and wealth. The report came out at the same time that Oxfam released new global inequality figures, showing that the world’s 26 richest billionaires own as much wealth as the 3.8 billion people who make up the poorest half of the world’s population. It also finds that in some countries, the poorest 10 percent of the world are paying a higher proportion of their incomes in tax than the richest 10 percent. “There is a lot of reliance … on the good deeds of philanthropists,” Ceddia said, but “ultimately the sheer presence of such wealth disparities have detrimental effects for society. “Any [policy] action on any form of inequality is urgent,” he said. Copyright © Source (mentioned above). All rights reserved. The Land Portal distributes materials without the copyright owner’s permission based on the “fair use” doctrine of copyright, meaning that we post news articles for non-commercial, informative purposes. If you are the owner of the article or report and would like it to be removed, please contact us at hello@landportal.info and we will remove the posting immediately. Various news items related to land governance are posted on the Land Portal every day by the Land Portal users, from various sources, such as news organizations and other institutions and individuals, representing a diversity of positions on every topic. The copyright lies with the source of the article; the Land Portal Foundation does not have the legal right to edit or correct the article, nor does the Foundation endorse its content. To make corrections or ask for permission to republish or other authorized use of this material, please contact the copyright holder.